Do you want to blogging? If yes, then is blogging right for you? You should ask yourself these questions, whether you want to be a personal blogger or a professional blogger. You've heard somewhere through the medium of blogging, people earn a lot of money, and you also walk in the same line. But accept the truth, as easy as it sounds, it is actually not that easy. If you have a little bit of idea about blogging, you will also know that this is a good way to earn money sitting at home. There are also many people, who do not have the full information about it, start their own blog and fail to earn income through it. If you want to make your carrier in this line, then think 100 times before starting. 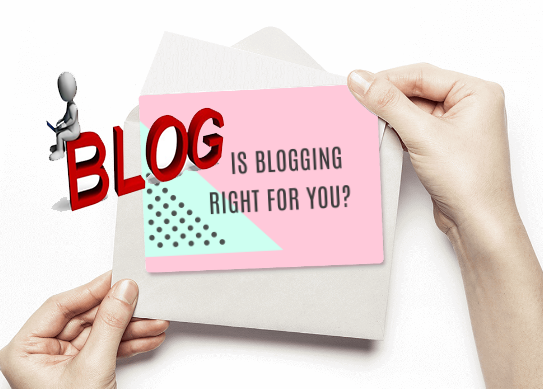 I have talked about some points here, which will help you get the right decision, whether blogging is right for you or not. What do professional bloggers do? If you have a story or experience, then you can share it with the people through blogging. We call it a personal blogger. Take the famous Bollywood actor Amitabh Bachchan as an example. They have a blog, where they share about me and their experience. They do not have any motive to make money through blogging. These are called personal bloggers who share anything randomly without any plan. But a professional blogger is a specialist. One of which has a lot of knowledge in one subject. It can be any topic, like technology, cooking, business, fashion, health, etc. If you have more knowledge than others in one subject, it means that, you can share more information in the same bed. It should not happen that you are not aware of the basics you are writing above and ask a question if you do not know. It is not written that someone is writing above any technology and he is receiving a good response, that does not mean that you also start writing about him. All you have to do is share it, in which you are the expert. If you have mastered some thing and you are blogging in the same topic, it takes time, money, hard work, it does not mean that you will be successful. There is a need for some things to blogging, and the most ego is to write. If you do not like to write, and you are thinking that slowly you will get used to it, then stop fooling yourself. These luminaries occur with very few people. If you want to write to someone else, you will feel like a burden. "Do whatever you like, then they will not play the work. These 3 idiots have said in the movie Rancho, which is the truth of the truth. If you do not like to write, believe me, blogging is not the right decision for you. Blogging is a long trip. It takes time to make this a success. You design your blog, share your knowledge and promote it in the world of internet. It requires your hard work, passion and patience. Your money will start coming soon after you start blog, this is a bad thing. You will have to work honestly for this. If you do not know if blogging is right for you, just look at these points. If you have all these features in you, then you can easily reach your destination.